In the past decade, archeological discoveries in the Americas have forced scientists to reassess when ancient humans first crossed the ice-free Bering Land Bridge into North America. New research on the Chan Hol II skeleton — discovered in February 2012 in an underwater cave and plundered a few weeks after photos of it were made public — shows that the 80-percent-complete skeleton was 13,000 years old. The first humans probably arrived in North America during the late Pleistocene era, and the oldest evidence of their presence can be found in sunny, tropical Mexico, which then was an arid landscape. “It looks as if the oldest osteological remains of humans in the Americas are all reported from the Tulum system of submerged caves,” Wolfgang Stinnesbeck, Ph.D., a University of Heidelberg geoscientist and lead author of the PLOS ONE paper published Wednesday, tells Inverse. The Chan Hol II archaeological site prior to looting. The arrow points to the CH-7 stalagmite analyzed by researchers. The skull was stolen a few weeks after it was discovered in 2012, though. Stinnesbeck and his team drew this conclusion from that prehistoric pelvis, discovered near the Chan Hol cave around Tulum, Mexico. This cave is part of a vast system of underwater carbonate bedrock caves that are alternately filled with salt and fresh water, and human remains have been found there before. The pelvis probably belonged to a young man who lived approximately 13,000 years ago, says Stinnesbeck, making it one of the oldest examples of a human found in the Americas. “When my Mexican colleagues Arturo González and Jerónimo Avilés showed me the first photos of the Chan Hol site, I immediately knew that we had something special,” says Stinnesbeck, who explains that the special interaction between the specimens and their environment is what made dating possible. The pelvic bone they found covered with stalagmite, he says, offered a “perfect opportunity” to determine, with certainty, the age of the Tulum residents. The stalagmite is also what kept that part of the skeleton out the hands of thieves, as it was rooted to the seafloor. “This was really exciting!” he says. The arrow points to the ancient pelvis. Bones of this age are hard to date because they no longer contain collagen, which is crucial to the dating process. But because of the unique environment in which the pelvic bone was found, Stinnesbeck’s team was able to date it by measuring the uranium, carbon, and oxygen isotopes in the bone itself and in the stalagmite that had grown through it. The oxygen and carbon isotope ratios in their calcite layers store important climate and precipitation data, which in turn sheds light on their age. The pelvis bone represents the third human specimen that had been found in this system of caves, which together are some of the oldest remains found in the Americas. Which of the three is the oldest can’t be unequivocally answered, says Stinnesbeck, because their skeletons contain such small amounts of collagen. Even the bioapatite (a form of calcium) in the skeletons, which can sometimes be used for carbon dating, seems to be contaminated. “Our minimum age for the Chan Hol skeleton is thus more reliable than those of the other [two skeletons discovered], but it also underlies the importance of all skeletons from the Tulum as really old,” says Stinnesbeck. A closer look at the young Tulum man's pelvic bone. The advanced age of this particular pelvis won’t settle the debate about when humans arrived in the Americas, says Stinnesbeck, but it does support the idea that humans came to the continent at least 5,000 years before the Clovis, who have historically been considered the “first Americans.” They lived in what is now present-day United States, Mexico, and Central America. Stinnesbeck’s work is in line with recent archeological discoveries in places like the Paisley Caves in Oregon and Monte Verde, Chile, where humans older than the Clovis have also been found. 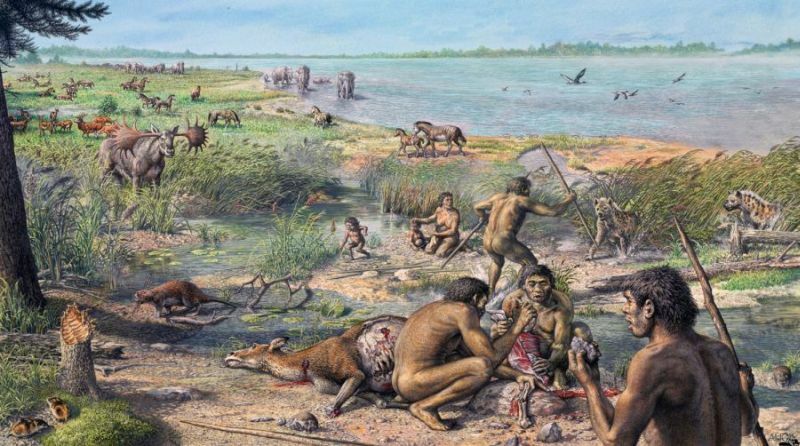 An artist's rendering of what life might have been like during the Pleistocene era. Together, the specimens in these places firmly place human migration to the Americas in the Pleistocene era, a time scientists understand as a period of massive evolutionary and migratory expansion for humans. If you’re interested in more of Inverse’s science coverage, check out this video on metallic hydrogen.